To be as flexible as possible we built the theme home page on different widget areas where you can activate widgets via drag and drop. There are two full-width areas (top and bottom), the main content area and of course the sidebar. Like the home page the single listing page consists of multiple widget areas where you can activate widgets to your liking. 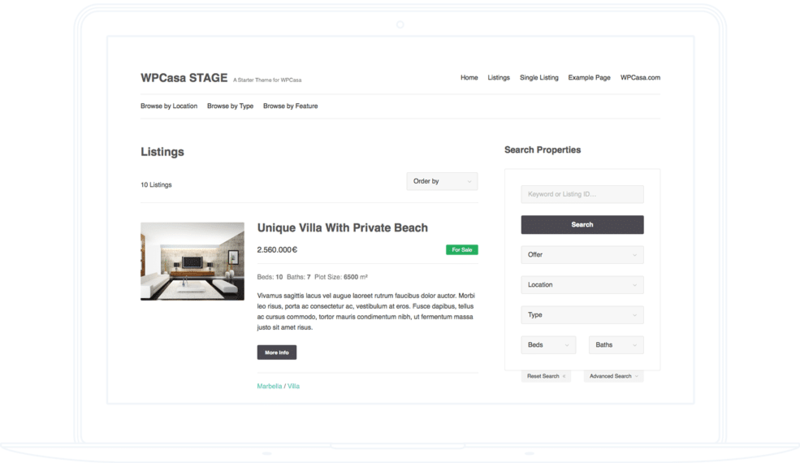 Setting up the listing page is a breeze using the included widgets to display property information. This theme is based on a lightweight but very powerful framework that comes with HTML5, CSS3 and a set of pre-styled elements. A clear grid with extremely useful classes are a great starting point for your custom WPCasa theme. The theme comes with an image-based and professional-looking slider that ensures a great visual impact in a reduced space. Activate the widget with a useful set of options for slider setttings and to filter the displayed listings etc.